There are a lot of bad lunch options in the Financial District. Go for one of these good ones instead. 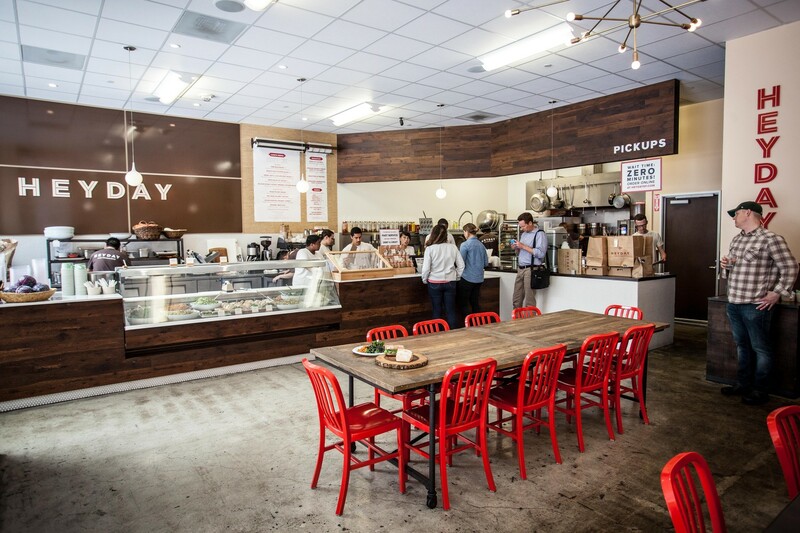 Where to have a healthy lunch in San Francisco, organized by neighborhood. Some combinations just work. Like Steph and Klay or BART stations and urine stench. Or soup, sandwich, and salad combos in office-heavy neighborhoods that actually need them. So, people of FiDi, meet Hey Day, if you haven't yet. Most importantly, meet its $11 lunch special. You can choose any small salad, soup or half sandwich for $6.50; combine any two for $11. Like the salad bar, you can get a couple different flavors, but at least here, a professional is curating for you. If you nicely ask your server, they'll spoon multiple salads into one container to get diversify your lunch even further. There are about a dozen options daily, with a frequently changing menu. Everything's fresh and healthy (or at least feels that way) - think beets, lentils, faro, kale, etc. You won’t be needing that George Costanza desk nap at 2:30. Heyday is an excellent respite from the usual pay-by weight salad bar below your office where you can never decide what theme salad to make and always end up with some monster Chinese-chicken-Cobb-Southwest-Greek hybrid. And that's why we're telling you about it. In a sea of mediocrity, this is just about the best reliable lunch option we've come across in the area. At Heyday, nothing looks or tastes like it’s been sitting on ice under a sneeze guard for 4 hours, and that alone goes a long way around here. Oh hello toasted sunflower seeds. Thanks for coming over. Have you met my friend avocado yogurt dressing? You guys should get to know each other. This is so healthy, it counts as going on two runs. Just shake your Fitbit a bunch while eating. Super filling, if you’re worried about getting hungry mid-afternoon. Sometimes a bit heavy on the oil/vinegar if they’re getting to the bottom of the huge Heyday serving bowl. But some people are into that. We wish they never changed this from the killer salami, fennel and parmesan sandwich of yore, but still a nice, little Italian sando. The cold meatloaf sandwich might raise some eyebrows, but trust that with the peppy chimichurri on top, this little guy will not disappoint. Plouf has great French food down an alley that's worth heading to FiDi for. A fairly corporate Financial District Japanese spot that's perfectly suited to dinner with your boss. Comstock Saloon is an old-school spot in North Beach serving great food and cocktails. Get the brussels sprouts. We can always rely on Cotogna in the Financial District for an excellent upscale Italian meal. The greatest neighborhood restaurant you can never get into. Bette’s in Berkeley is an upscale 1950s-style diner that does a boozy brunch worth the guaranteed 45-minute wait. There are no picnics at Picnic On Third in Soma, but there are some tasty lunch options. Pita-wrapped meats find their Elysium at Souvla in Hayes Valley. Zeus would be proud. Just another great sandwich place — don't get spoiled. The excellent cheese Cowgirl Creamery in Pt. Reyes is worth driving for, and is a great way to cancel out any calories you burned on a nearby hike. Homage in the Financial District serves a regularly changing menu of food sourced from local farms.